Louis Vuitton Monogram Canvas Mini Pochette Pouch Accessories M58009 Click here for pricing and shipping information. Playful and compact, the Mini Pochette Accessoires in Monogram canvas is a delightful way to carry those essentials. It can be attached to other bags or simply carried on its own. As you can see in the following pictures it’s easy to keep the chain as a decorative element to the purse while keeping attached the monogrammed leather strap for length and convenience. ADORABLE: I love the feel of the material in my hands and I love the gold chain and detailing. This purse is super cute. It will contain and hold your necessities; phone keys and cards. Don’t expect this adorable bag to carry a full purse-load. It’s perfect if you’re running somewhere quickly or if you’re trying to carry as little as possible while still remaining fabulous. 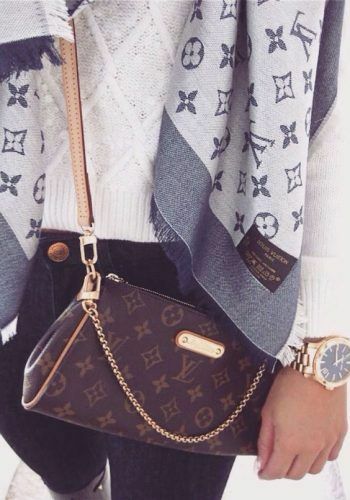 The gold chain brings some extra shine and attitude to the purse; which helps it stand out from other Louis Vuitton purses that might blend together in appearance. This purse comes with authentic Louis Vuitton packing box and paper. Accent items are wrapped to maintain its original quality, from France to your door. Next Louis Vuitton Damier Azur Canvas Mini Pochette!